Getting to know Singapore is a bit like trying to date a highly strung power woman in her thirties. She’s had time to clean up her act, sanitise it and present the best version of herself to the world. It takes a certain amount of effort, energy and insider know-how to get her guard down, go beyond the perfect facade and discover who she really is. Fortunately, the Andaz Singapore has already done most of the hard work. The hotel is the Hyatt sub-brand’s first in Southeast Asia. It occupies the top 15 storeys (it starts on the 25th floor) of Duo, a curvilinear honeycomb creation of twin buildings designed by Buro Ole Scheeren. 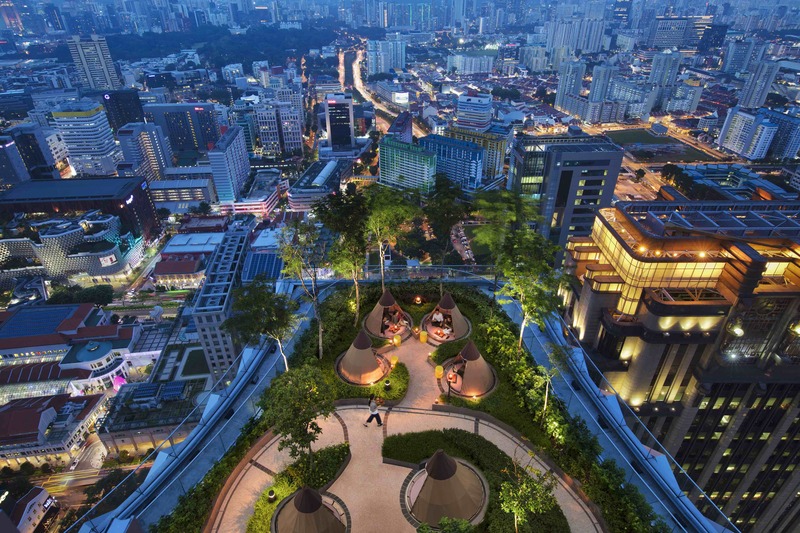 This giant mixed-use development sits in Singapore’s Bugis Street neighbourhood, close by equally colourful areas such as Kampong Glam, Little India and Bras Basah. Check-in at the Andaz is easy and free-flow, and before we know it, we’re boarding lifts with displays that echo old streetlamps and where the access-card reader resembles a shophouse letterbox. In the rooms, a guide to the locality lists the Andaz team’s favourite spots for crab curry and bak kut teh, so we can enjoy a more authentic, nitty-gritty experience. As for the room itself, much of it bears the clean Japanese-style quality that’s a signature of André Fu. Here, the Hong Kong-born designer draws liberally from the spice trade of which Singapore was an epicentre, with cheery yellow accents everywhere – from the wooden shophouse-style doors that lead to the bathroom, to cushions, stationery boxes and even the bathroom stools. As per Fu, everything from the wooden hangers to the way the bedside tables sit is well thought-through in terms of both function and form. After settling in, we head straight to the hotel’s top-floor bar Mr Stork, which serves cocktails such as The Rhubarb – rhubarb purée, strawberry lemon juice, sparkling wine and a shot of vodka — or Andaz Singapore’s own pale ale, a crisp, fruity brew specially concocted by the local RedDot Brewhouse. Here we also get an overview – a 360-degree, wraparound vista – of the island-state and start quizzing one another on any landmarks we can spot. A perilous glance straight down reveals Beach Road and Singapore’s prized possessions: shophouses saved from demolition in the country’s wave of modernisation. We vaguely gesture towards Chinatown in one direction and in another point out Marina Bay Sands. It’s a good day when, without much squinting, we can see Indonesia just across the water. The hotel is a love letter to its setting, its Fu-designed interiors inspired by aspects of Peranakan culture and historic Singapore. They also make discreet references to nature, and the area’s cultural and architectural heritage: the abundant foliage in the entryway is a nod to Singapore’s lush garden-city character, for example, while the corridors are inspired by Arab Street shophouses and the narrow byways of Kampong Glam. As in all Andaz hotels, aspects of the surrounding city are reflected in the public lounge, and in The Sunroom – a bright, airy space that partly overlooks the pool and partly the city. The Andaz iced tea served here is made with Singapore’s famed indigenous pandan leaf; we sip ours while snacking on little salted morsels that children of the island grow up eating. On the topic of food, the hotel houses 10 bars and restaurants, five of which are interconnected on the 25th-floor Alley on 25, a recreation of local hawker centres – thoroughfares lined with myriad food and drink stalls. There’s The Green Oven for those who want their food – from lamb shank to spring chicken – cooked in, well, a big green oven. Plancha’Lah! is a private chef’s-table teppanyaki experience that opens only for dinner, while my personal favourite, Auntie’s Wok and Steam, overlooks Little India and is devoted to Singapore’s zi char-food culture with a slight Szechuan kick. Those with a predilection for the finer things, however, will probably make a beeline for 665F, a steakhouse led by chef Josephine Lok. Breakfast at Alley on 25 is a delight. Guests can grab a table and amble through all five restaurants, taking their pick from full American to laksa. Outside, the hotel is surrounded by Singapore’s very best: Zam Zam for murtabak and nasi biryani; or Dong Po Colonial Cafe for baked treats. Arab Street, Masjid Sultan (the Sultan’s Mosque) and perfumeries such as Sifr Aromatics are but a five-minute walk away, while stores like Supermama and Scene Shang offer locally designed homewares that keep me occupied for hours calculating my cost-to- baggage-limit ratio. But there’s one thing I’m definitely not leaving without – the Andaz Singapore’s own killer reinterpretation of pandan cake, which is one souvenir that’s well worth hand-carrying all the way home. Zaneta started her career in fashion journalism at British independent magazine Tank after realising a masters degree in Shakespeare gave her more anxiety than joy. Having honed her eye and predilection for new and emerging fashion talent she returned to Hong Kong in the hopes of uncovering fashion talent across Asia whilst shedding new light on establishment favourites. She writes across fashion, travel, culture, jewellery and wellness. When she’s not working, she’s either online shopping, reading Joan Didion or pretending she doesn’t drink but surreptitiously reaching for some ice cold Belle Époque.